FluidSolids® is an innovation that makes it possible to transform organic waste into biocomposites. A technology platform designed for the circular economy. Material innovation justifies itself on the strength of added value: it makes products and applications more flexible, stable, ecological, and cost efficient. FluidSolids® meets all these requirements. With its excellent ecological and physical qualities, the new biocomposite FluidSolids® developed in Switzerland has the potential to capture the market in the near future as an alternative material for myriads of products made of metal, wood, and especially plastic. In comparison to other biopolymers, FluidSolids® does not compete with the food supply chain—it is made of by-products of renewable raw material. This highly versatile biocomposite is processable with the conventional techniques of industrial mass production. Enormous potential lies in its capacity to address the substantial environmental problem of plastic packaging waste. Its ecological qualities predestine FluidSolids® to be sought-after by sustainability managers worldwide to make environmental strategies become real. FluidSolids® is a biodegradable composite material. The components consist of renewable resources that are procured from industrial by-products, therefore no agricultural land is used. The material is nontoxic, odor- and emission-free and has a minimal carbon footprint. FluidSolids® features maximum surface finish and molding accuracy, a variety of surfaces, structures, and colors next to highly modifiable physical qualities and durability. FluidSolids Inc. (CH). 2011: born in Zürich—1 employee experiments with first showcases. 2012 – 2013: childhood years—2 employees prototype small series and realize a first customer project. Collaboration with the University of Applied Sciences Rapperswil. 2014 – 2015: school years—3 employees produce small series and prototypes of larger series. Collaboration with the Swiss Federal Institute of Technology. 2016: leaving parental home—5 employees produce large series and prototypes for mass production. Moving into the pilot plant in Zürich. 2017: studies—5 employees develop products and processes for mass production. 2018: work experience—6 employees ramp-up mass production. If society wants to be serious about the environment, the production and use of synthetic plastic, especially single use plastics, has to stop. The designer Beat Karrer, with a small team in Zurich and through a research collaboration with the University of Applied Science in Rapperswil, invented a serious alternative. 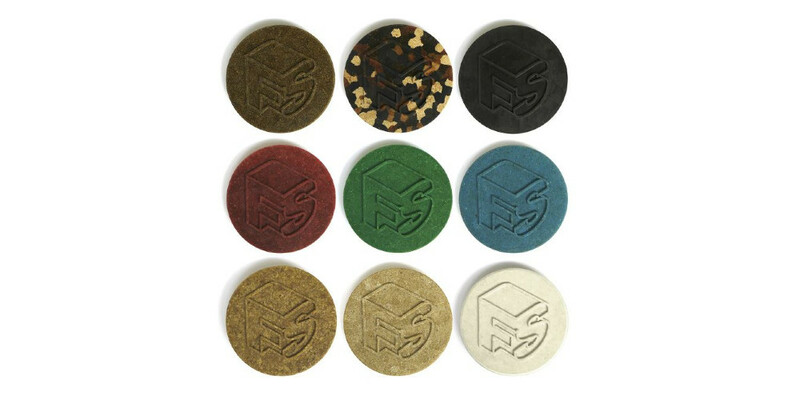 FluidSolids is a new bio-based material made from natural industrial waste like wood, foods, or paper. Compared to other bio-polymers currently on the market, this approach is convincing as it uses existing waste and turns it into value without any compromises in design or quality of the material. This bioplastic can be used for furniture, interior design, electronics, and packaging—the only difference is it’s either reusable or 100% compostable. Companies and large industrial players will only make impactful ecological investments if they also offer clear economic benefits.